BATTLE FOR WORLD / SPUTNIK NEWS | April 20, 2019: The article highlights that the arrival of Russian military planes in Venezuela in March 2019 prompted harsh criticism from the US and has accused Moscow of destabilising the situation in the Latin American state that is currently submerged in political crisis. The planes the US is referring to, from Russia, the planes arrived under a bilateral agreement with Caracas and there was no violation. The US is urging the international community to deny Russian planes flying to Venezuela a right of passage through their airspace, following the example of such a move by Malta. Morgan Ortagus, spokesperson for the United States Department of State, said such a decision could help stop Russian support for the country’s President Nicolas Maduro. BATTLE FOR WORLD / TASS | April 16, 2019: The article highlights that Venezuelan authorities are accusing the United States, Brazil and Colombia that they are in the process of preparing for a military intervention into the Bolivarian Republic. That “US, Brazilian and Colombian officials intend to ignore the will of the Venezuelan people and launch a military intervention,” said Rodriguez. Venezuela has seen major disruptions in operations of the power supply systems affecting majority of regions in the country from early March (2019). The largest shutdown occurred on March 7 when Caracas and the majority of other areas were left without electricity for several days. Russia has offered to help Venezuela repair their power grids. BATTLE FOR WORLD / RT | April 5, 2019: The video highlights that the US is developing a rescue plan for Venezuela’s economy – designed to pump cash into the country through banks, smartphones and apps. The Trump administration isn’t rushing to reveal details, but the plan has one key condition, that Maduro must go. The US has sabotaged the Venezuelan economy, taking a percentage of the country’s finances hostage, held with terms of condition. 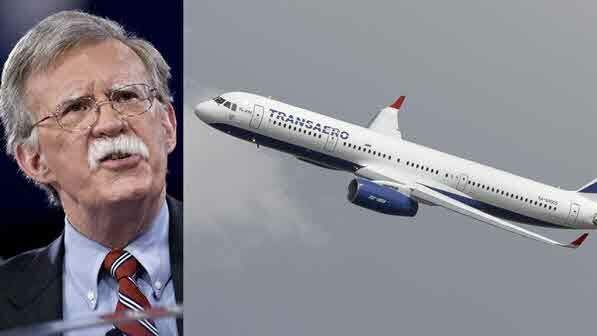 BATTLE FOR WORLD / RT AMERICA | April 5, 2019: The video highlights the infamous neocon John Bolton has been testing the boundaries of his role as national security advisor. He’s accumulating more and more power in the Trump administration, implementing his own foreign policy vision, eclipsing that of President Trump – how did that happen? Daniel McAdams of the Ron Paul Institute joins Rick Sanchez to discuss the situation. BATTLE FOR WORLD / REUTERS | April 6, 2019: The article highlights that the country of Switzerland and the United States have signed an agreement on Friday (April 5) for the neutral country to represent U.S. interests in Venezuela, which broke off diplomatic relations with Washington [DC] after it recognised the opposition leader Juan Guaido as president. The agreement signed by the Foreign Minister of Switzerland and the U.S. ambassador to Switzerland in Berne, should help defuse tensions between the United States and Venezuela, the Swiss government said, but that first Venezuela must agree to let Switzerland take on the role. The Swiss government said: “The mandate provides Switzerland the opportunity to contribute to de-escalating tensions between the two countries and thus play a constructive role on behalf of regional stability,” and noted that such stability would also be in the interest of the neighbouring countries in the region. The United States and dozens of other countries stand at odds with the government of Venezuela’s Nicolas Maduro, after the US and allies recognised self-proclaimed opposition leader Juan Guaido as the legitimate president of Venezuela. What appears to unfold after is a form of hybrid-warfare attacking the country’s infrastructure so that the people in the country can turn against Maduro.